I caught a quick NPR clip about toy cars on my way into work this morning. The connection between the fantasy world of toy cars and their real-life counterparts is absolutely direct — a highway that moves in both directions, very fast. Car companies license their designs to toy companies, and toy companies reflect auto trends in their merchandise. Car companies are hoping that if they can interest these kids in driving now, they'll be drivers in the future — and that when they trade in those Cozy Coupes for highway-ready vehicles, they might be choosing between brands they recognize from their toy boxes. The thing that I kept thinking about as I listened was how many times I've heard people say "It's just a toy." They use this to silence complaints over unrealistic Barbie dolls and Disney's Merida toy that looks nothing like her movie heroine. They use this to call people concerned over the gender stereotypes present in toys for infants and toddlers "oversensitive" and dismiss them as "overreacting." The fact that car companies are creating lucrative partnerships with toy companies should tip us off to the fact that there is no such thing as "just" a toy. These companies know that the key to making money is getting a strong core of familiar customers early, and they know that toys are the way to connect with an upcoming generation. 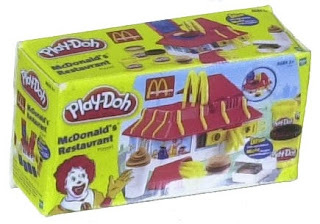 There's a reason that McDonald's is willing to put its label on Play-Doh food sets and that Wal-Mart includes a truck with their logo on it in a set of toys. Children are perceptive, inquisitive, and critically engaged with the world around them. The messages that they receive from toys stay with them. If playing with a toy Mustang can help insure Ford's profit margin for the future, then what do you think playing with nothing but stick-thin dolls does to a little girl's future sense of body image? What do you think seeing all of the toy ovens painted pink and sparkly does to a little boy's future cooking habits? Toys are not "just" toys; they are bridges from childhood into an adulthood of product consumption and identity creation, and it matters what messages they send.